Director – Anthony C. Ferrante, Screenplay – Thunder Levin, Producer – David Michael Latt, Photography – Ben Demaree, Laura Beth Love & Scott Wheeler, Music – Christopher Cano & Chris Ridenhour, Visual Effects Supervisors – Glen Campbell, Joseph J. Lawson & Emile Edwin Smith, Production Design – Caitlin Laingen & Kalise Wallace. Production Company – The Asylum. Fin Shepard is in Washington D.C. to receive a Medal of Honor from The President when he is instrumental in fending off another sharknado that hits the capital, destroying the White House. With D.C. in lockdown, Fin sets out across country to where April is holidaying at the Universal theme park in Orlando, Florida. Fighting through sharknados that are growing in strength and ferocity, Fin joins up with Nova along the way. As a massive wall of shark storms block off the entire eastern US seaboard, Fin realises that the only option to save the country is to contact his father, a former NASA astronaut, and launch the space shuttle. Sharknado (2013) was one of the genuine cult bad movies hits of the 2010s. Where most cult bad movies gain their following via midnight revivals some years after the fact, the Sharknado phenomenon spontaneously evolved following its airing on the Syfy Channel where people’s live tweets about how ridiculous what they were watching was caused a massive buzz that suddenly had the film being joked about by talk show hosts, ‘sharknado’ being coined as a buzzword in articles and the film revived for midnight screenings accompanied by live heckling. The Asylum, a company noted for their ability to rip off other people’s films with soundalike titles, announced a sequel within days. In trying to top the phenomenon of the first film, Sharknado 2: The Second One (2014) felt self-conscious. It was The Asylum awkwardly trying to recreate something that had spontaneously generated around the first film and nodding and winking to its audience about how ridiculous it was being. And there was a bunch of celebrities and moderately well-known faces on hand to show they were in on the joke. Not unexpectedly, the effort felt forced. The good news is that by the time of Sharknado 3: Oh Hell No! that balance has been restored and we have a film that is well back in the element of trying to be as ridiculous as possible and less concerned at winking to its audience, much to the better. I ended up enjoying Oh Hell No! the most of all the Sharknado films. The ridiculousness sets in from the opening shot, which is a parody of the famous opening of the James Bond films where instead of the view down a gun barrel we have a view from out of a shark’s mouth as Ian Ziering walks into shot and poses with a chainsaw. There is the highly entertaining subsequent sequence where a sharknado hits Washington D.C., which hits a perfect tongue-in-cheek stride with sharks being flung through the air to land in Lincoln’s lap on the Lincoln Memorial, a cleaning lady holding off a shark with a vacuum cleaner, sharks erupting out of the presidential security bunker and Ian Ziering finally impaling a shark on the toppled flagpole outside the ruins of the White House. Anthony C. Ferrante and co pull off some hilariously tongue-in-cheek sequences, including at one point a shark doing circles around the hoop of a rollercoaster. There is the very funny sequence where Frankie Muniz struggles back to the van only to progressively get first either of his legs eaten off by sharks followed by his arms and finally be left crawling along on his stumps and have to activate the bomb switch with his chin. The most entertainingly ridiculous of these is the climactic scenes where the plot improbably contrives it necessary for Ian Ziering, Tara Reid and his father David Hasselhoff to have to launch the space shuttle, which for some even more contrived reason is the only means of stopping a massive sharknado that is covering the entire US eastern seaboard. This leads to the inevitable scenes with sharks travelling up into space and then invading the space shuttle as Ziering fights them off. 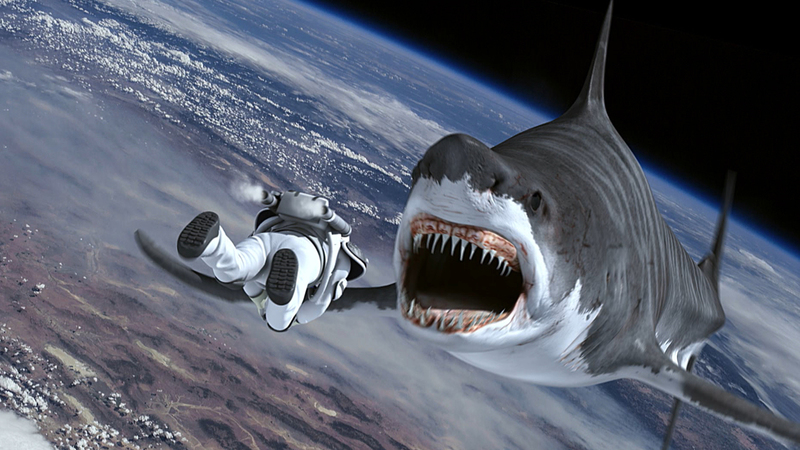 The climax of the film involves Ian Ziering disappearing into the gullet of a giant shark to rescue Tara Reid who has been swallowed by another shark and falling to Earth inside its body as it is incinerating from re-entry heat, landing on the ground safely and rushing to cut Reid out just as her baby is born and has to be C-sectioned out of the side of the shark. As in Sharknado 2, there is a range of celebrity cameos. These include everybody from 1980s sexpot Bo Derek cast as Tara Reid’s mother, while a grizzled David Hasselhoff slots in perfectly as Ian Ziering’s father. Other cameos include rapper Ne-Yo, 80s voice artist Michael Winslow, actors Christopher Judge, Lorenzo Lamas, Star Trek: Voyager (1995-2001) actor Tim Russ and magician Penn Jillette as soldiers, wrestler Chris Jericho as the rollercoaster attendant, internet magnate and film producer Mark Cuban as The President, teen YouTube beauty guru Blair Fowler as Ryan Newman’s best friend, Jerry Springer as a tourist eaten by a shark and Game of Thrones (2011– )’s creator George R.R. Martin as a man who gets devoured while eating popcorn in a movie theatre, as well as ILM animatronics expert Grant Imahara, writer Jackie Collins and former Hugh Hefner girlfriend Kendra Wilkinson in there somewhere. Perhaps two of the most contentious names present are those of outspoken conservative columnist Ann Coulter who is cast as the Vice President and a brief interview with congresswoman Michele Bachmann, the public figure most associated with the US Tea Party movement. It is hard to entirely be sure if it is The Asylum letting their own personal political views spill over into the film in associating with such reactionary figures or else it is covertly parodying either figure in placing them in such a wilfully ridiculous film. This was followed by Sharknado: The 4th Awakens (2016), Sharknado 5: Global Swarming (2017) and The Last Sharknado: It’s About Time (2018).